Happy pre-spring! The weather is getting warmer here in Albuquerque and that can only mean one thing.. SPRING CLEANING. This week I have a few household tips for sprucing up your humble abode for the freshest of days. I will be giving a few hints on your 5 senses. Smell, touch, sight, hearing, and taste. To being, freshen your home with a wax warmer but not any old wax warmer. 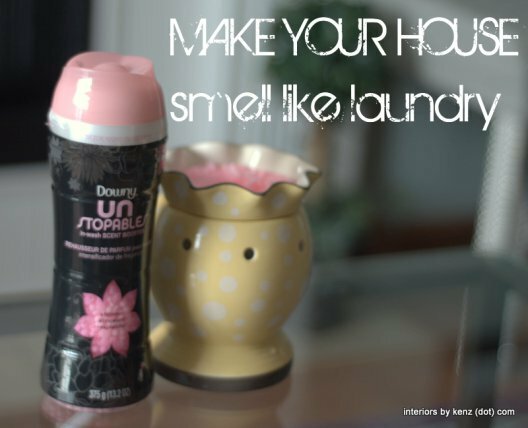 Try putting Downey Unstoppables in place of the wax in order to get that fresh laundry scent. What about touch? 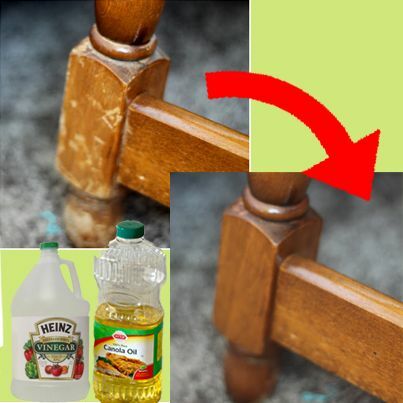 Clean up those roughed up wooden table legs with a little vinegar and canola old and there you have it. Smooth furniture for those spring get-togethers. Third, my favorite component to any living area is adding fresh flowers. They lighten the mood and bring life into the space. You can make this your own by decorating a vase or picking flowers in your neighborhood instead of from the store. Some great tunes I recommend for pre spring a slow and laid back. My friend is actually a local artist that was just featured on 104.7 The Edge. They are a great group of 20 something year olds who whose influences include Coldplay and Death Cab for Cutie. 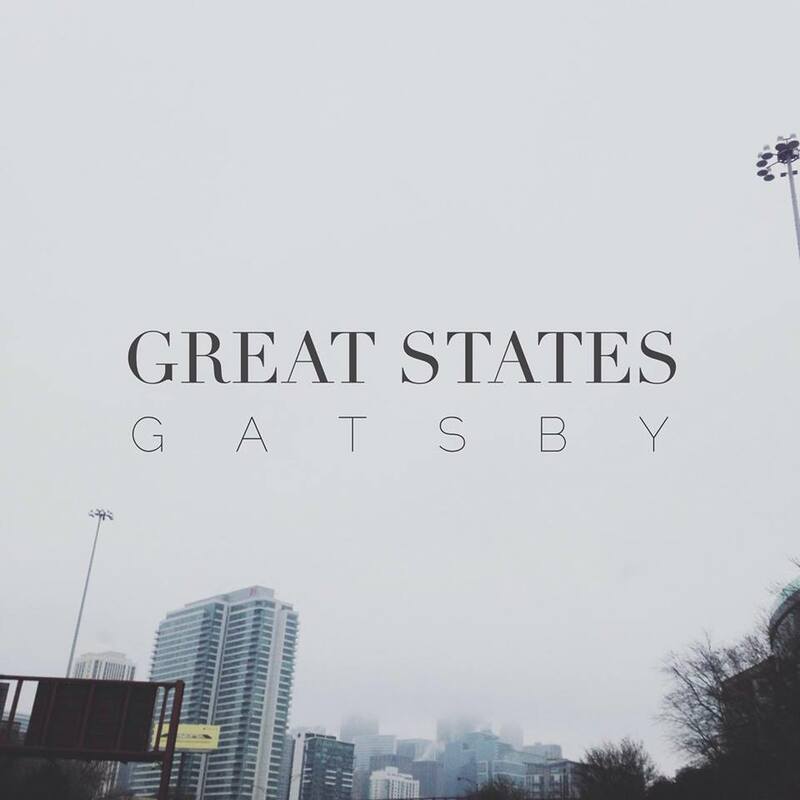 Check out Great States and their new song Arcadia via Spotify or iTunes to purchase. Finally, I want to save your savory foods by covering them with a money saving alternative. Flower pots! 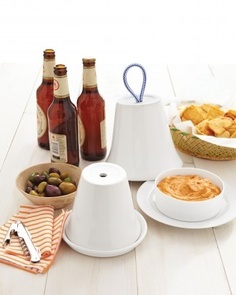 Just add a string through the hole and decorate the outside for a great view and tasty treats (minus the bugs). Hope you all are enjoying this time of year as much as I am right now. Pre spring brings so many great opportunities for new starts. Just do not forget the time change! Remember to indulge in your 5 senses this week and I will be in touch with next week with another fresh find. It was enlightening to read an article called, “Why Fans Un-friend Your Brand on Facebook” by Ann Marie Kerwin. One issue brought up is that Facebook is reducing the advantages of having a business page by regulating Timeline posts from friends and forcing them to spend money to make their posts more frequent and successful. Who want to pay for their advertisements? NO one. So how would I change my posts to grow my Facebook audience you might ask? Kerwin states that a top reason for loss in brand followers is disinterest. DDB even states that the United States, United Kingdom, and France want to hear less marketing and have already stopped liking pages on Facebook. Personally, this stands out to me that our communities are tired of the same marketing tactics where it seems like companies are just trying to sell something to the world. Kerwin exclaims that 21% of fans agree that they are receiving too may advertisements. My suggestions are to be engaging, timely, and friendly in your posts. These can all be achieved while being top business owners of companies because the best way to reach out to your audience is to relate to them. To be engaging is to be creative and think outside of the box. One aspect I try to even remember with this blog is to write on topics that are relevant to my audience are what they are going through in this day and age. All in all, this translates to keeping up with popular topics and catching a consumers’ eye with media content like pictures of videos. Remember that consumer control the world of social media. So while you can still be yourself or your business, it is important to cater to your audience’s needs and attention span. Second, I would remain timely. I even suggest keeping videos to at least a minute in length so that busy consumers feel that they have the time to watch your content. Being timely also means staying up to date with your posts. According to the 36 Rules of Social Media, a social media aficionado should, “update your page or delete it”. I take this as showing how quickly your content can become old. Just because you post frequently does not mean at odd hours or too often. 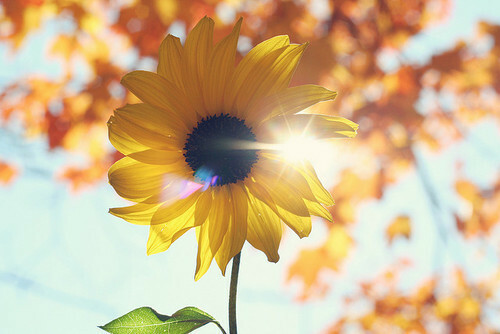 Keeping posts to popular times like on the weekends when people have free time is important in showcasing what message you are sending to your consumer. However, they do not want to be bombarded with information either so I would keep is concise and to the point. Since you do not want to bug your audience so much that they unfollow you, I always try to write in a manner that reaches out to them personally. Whether it be how I sign off on my posts, a picture or whatever you make of it, I will add my special bit of creativity and a component that touches my audience. If you find yourself in a social media funk, I hope you can reference this post to remember to keep your Facebook posts fresh by being engaging, timely, and friendly. Whether you celebrated “Gal”entine’s, with a significant other, or family I hope I find you enjoying that 50% off, post Valentine’s day chocolate. This week I have an awesome find for YOU. This holiday can be wonderful and a pain because it brings about those extra calories we do not want. According to Anisha Batia on NDTVcooks.com, “every year nearly 8 million candy hearts are produced” for stores across the nation. However, I have found a tasty alternative snack that can still quench your sweet tooth. Many may cringe at the sight of fruit but one way to make this semi-sweet snack healthy is baking them in the oven with NO additional ingredients. 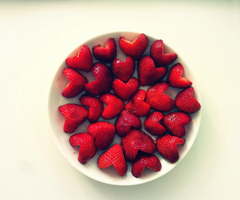 For those of you stuck on love, I highly recommend trying strawberries. They taste like candy but are healthy and natural. Voila! A new face of the fruit we all know and love. If this just is not for you, I have a few other strawberry suggestions up my sleeve. You can make a breakfast pancake by simply adding banana, an egg, cinnamon, and strawberries. Another great idea is doing the classic strawberry smoothie with banana, greek yogurt, chia seeds, and almond milk. Finally, an all time classic with few calories is dipping your strawberries in a dash of cool whip. I know I am definitely working on my post Valentine calorie fix and will get back into my healthy routine in no time. Although that does not mean I cannot do it with a little flair. Next week, I will have a new focus plaguing young college women, and entrepreneurs in Albuquerque. If you have any questions or suggestions, please feel free to comment on this post. It is often in our society that one person affects millions by a simple act. One person that evokes this concept is Rachel Beckwith. Her single wish she on her 9th birthday was to fund water reclamation in Rwanda so that others could live healthy lives. However, a tragic car accident took her life before she could make her goal of $300.00. Jamie Pent did a spectacular thing by showcasing her story through a video blog that touched many and raised $1.2 million for the people in Rwanda to have clean drinking water. The truly remarkable aspect of this video is that nearly 500,000 people have seen it since last July, according to Matt Wilson in his article; Charity’s video racks up more than a half a million views. What makes this video so touching you might ask? Public Radio Personality, Ira Glass, says is best in his video blog on storytelling. Two “building blocks” he mentions are raising questions throughout a sequence of actions, and reflecting on the true meaning of the story. Pent does this by posting a video that has compelling music that leads viewers through the journey of Rachel’s parents going to Africa to see what the money Rachel’s wish raised helped do. The sequences include everything from interacting with the happy townspeople and putting a memorial up for Rachel. Glass also mentions that video blogging is when people find a “time to kill” or show their best work. I believe Pent did this by really outreaching to the audience and making an emotional connection. I will never forget seeing Rachel’s parents praying with the townspeople of Rwanda for Rachel or how touched a representative of the area was when they were explaining how appreciative they were for getting clean water. Overall, I highly recommend watching the video on Rachel on how her big wish became a reality. It touched me and half a million other views by using incredible graphics, and a heartwarming story to connect two communities and make one town’s life better. A social media professional is a new position taking the scenes on the job market. There is much dispute over what traits make these people successful and if the position is worth the price. Gary Vaynerchuk’s view of social media is drastically for “living in a digital world” while Peter Shankman is subjectively against it. Personally, I agree with Vaynerchuk because there is not a moment when you do not see people working with technology. However, I believe that their ideals have the common goal of having competent and engaging posts. If you want to be a social media professional I suggest three key traits: staying active with your posts, being mature with your content, and being passionate about your work. With such high access to media sharing devices, the world is always connected and it is expected that advertisements be readily updated. Staying up to date will not only keep your page fresh but your readers engaged. The greatest importance I see is being selective with these posts. The second trait I find important is maturity. The main emphasis in this trait is being taking seriously. Vaynerchuk mentioned that he did not care about what personal immaturities, like 3am pictures of partying, that a potential social media professional had on Facebook but if the person posted their content creatively and properly. I like that some people still want potential media professionals to be themselves within reason. This leads me to my last point, passion for your work. As with anything, there are going to be tasks that you do not want to undertake. When it comes down to your profession, I hope that anyone takes on their passion. In order to be able to succeed in the traits that are essential for a media professional this seems like a prerequisite. If a person is not happy with what they are working on it will reflect in the feedback of their site. Some other points that seem attainable once a person works in their passion are transparency and knowing the audience because the media professional will be able to relate to the ideas being communicated.